A judge bars Michigan from closing 98 medical marijuana businesses, an operator of two MMJ dispensaries in Oregon is sentenced to prison for federal tax crimes, and the U.S. Drug Enforcement Administration approves the importation of marijuana extracts from Canada for a clinical trial. 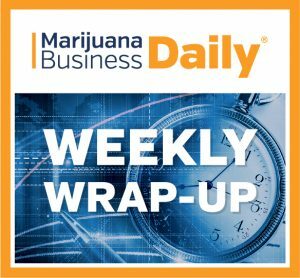 Here’s a closer look at some notable developments in the cannabis industry this week. A judge’s ruling that barred Michigan from shuttering 98 medical marijuana businesses helped avert what could have been a costly disruption to the state’s MMJ market, according to an industry expert. The judge’s action allows the businesses to continue operating and gives them breathing room to secure a permanent state license in time for a revised Dec. 15 licensing deadline. “It’s really a common-sense move,” Rick Thompson, editor and publisher of the Michigan Cannabis Industries Report, said of the judge’s ruling. Michigan regulators recently issued emergency rules to extend a Sept. 15 deadline by three months for existing MMJ businesses to receive their state licenses under a new, stricter statewide regulatory framework. But state officials granted that deadline only to 108 businesses that had completed a specified portion of their applications by June 15. The state ordered another 98 businesses that had failed to submit their paperwork by then to close. Michigan Court of Claims Judge Stephen Borrello rejected the state’s plan, saying both groups should be able to temporarily operate until the new Dec. 15 deadline. The three-month extension is expected to give Michigan regulators time to approve enough licenses to avert market chaos that could have led to supply shortages, Thompson indicated. The state has approved only 37 licenses so far, 19 for dispensaries. The seven-month sentence meted out to an Oregon marijuana shop operator convicted of failing to file federal tax returns is probably more of an outlier than the first of several tax cases targeting licensed MJ businesses. That’s according to longtime industry consultant Ford Pearson, CEO of Portland-based Green Rush Advisory Group. On Monday, Matthew Price, a part-owner and operator of the Oregon MJ retail chain Cannabliss, was sent to prison by federal prosecutors for cheating on his taxes. Pearson noted that Price ignored advice from several accountants and instead spent lavishly on luxury items like sports cars and pro basketball tickets. The situation can be chalked up to immature business decision making, Pearson said, which in his experience is atypical in today’s cannabis industry. “Most of the people I help in this industry these days are pretty well-funded and take this stuff very seriously,” Pearson said. However, he added, it’s possible the Oregon U.S. attorney’s office could end up targeting more licensed cannabis operators, depending on what it finds, especially because the market is under pressure from falling prices and a glut of marijuana product. “We might see more bad behaviors. But to say there’s some reason to think this kind of tax evasion or abuse is widespread, I haven’t seen anything that would lead me to believe that,” Pearson said. Business and science intersected when the University of California San Diego’s Center for Medicinal Cannabis Research announced that it had won Drug Enforcement Administration approval to import marijuana oil from a Canadian company, Tilray, for a study of essential tremor. The rare move highlighted the potential for greater cooperation between the business and medical worlds, but it also served as a reminder how U.S. cannabis research has lagged because of federal limitations. Should the federal government eventually loosen or do away with restrictions on cannabis studies, researchers will likely want their test product in oil form rather than flower, according to the lead researcher in the UC San Diego project. Fatta Nahab, a neurologist and director of the neuroimaging program at the university’s Movement Disorder Center, said he didn’t even consider trying to get product from the University of Mississippi, the sole federally approved grower in the United States. The decision had less to do with Mississippi school’s reputedly low-quality cannabis and more to do with the fact its products were available only as joints or flower that could be vaporized, Nahab said. Essential tremor, Nahab explained, afflicts mostly the elderly, so the test subjects will likely be seniors. Nahab was concerned about elderly test subjects smoking or vaporizing flower. He also felt oil was a better test product than flower. “I think from a scientific standpoint, there is a great deal more inconsistency based on how much you inhale (when consuming flower),” Nahab said. Nahab also believes the partnership between Tilray and UC San Diego can serve as a model of business-science cooperation. The import approval also highlighted the DEA’s failure to act on an effort launched at the end of the Obama era to expand the number of federally approved growers who can cultivate cannabis for research. More than 20 applications were submitted, but it’s not clear if they have even been reviewed, let alone acted upon.